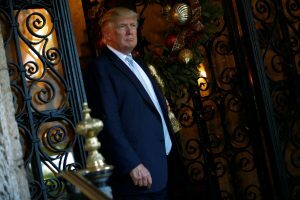 PALM BEACH, Fla. — President-elect Donald Trump says that “no computer is safe” when it comes to keeping information private, expressing new skepticism about the security of online communications his administration is likely to use for everything from day-to-day planning to international relations. Trump rarely uses email or computers, despite his frequent tweeting. Trump has repeatedly cast aside allegations by U.S. intelligence agencies that Russia tried to influence the presidential election through hacking. President Barack Obama ordered sanctions on Russian spy agencies last week, closed two Russian compounds and expelled 35 diplomats the U.S. said were really spies. The Russian government has denied the allegations. Trump plans to meet with intelligence officials in coming days to learn more about the allegations. He said he wants U.S. officials “to be sure because it’s a pretty serious charge.” He pointed to intelligence failures over the existence of weapons of mass destruction in Iraq before the U.S. invasion, and declared himself an expert in the area. Recently, President Vladimir Putin slammed U.S. plans to retaliate for Russia’s election hacking but said he would not toss out U.S. diplomats in turn. Hari Sreenivasan sits down with Andrew Weiss of the Carnegie Endowment for International Peace to discuss Putin’s aggressive tactics on the world stage, harassment of American personnel in Moscow and the future of U.S.-Russia relations. Trump made the comments during at his Mar-a-Lago club. Hundreds of guests gathered in the club’s grand ballroom, including action star Sylvester Stallone and romance novel model Fabio. Reporters were invited to watch as guests arrived. Earlier in the day, Trump ditched his press pool, traveling to play golf at one of his clubs without journalists on hand to ensure the public has knowledge of his whereabouts. A member of Trump’s golf club in Jupiter, Florida, posted a photo on Twitter of Trump on the greens Saturday morning and said about 25 U.S. Secret Service agents accompanied the president-elect. Reporters had not been advised of the visit to the club. Transition aide Stephanie Grisham confirmed that Trump had made a “last-minute trip” to Trump National Golf Club Jupiter, which is about a half-hour drive from Mar-a-Lago, where Trump has been spending the holidays. He returned to the estate at midafternoon. “We are in the home stretch of this transition period and don’t anticipate any additional situations like this between now and inauguration,” she said in a statement. With the arrival of 2017, another New Year’s message moved on Trump’s Twitter account at about midnight. This one was decidedly more upbeat, addressed to all Americans, and included an abbreviation for his campaign slogan: Make America Great Again.